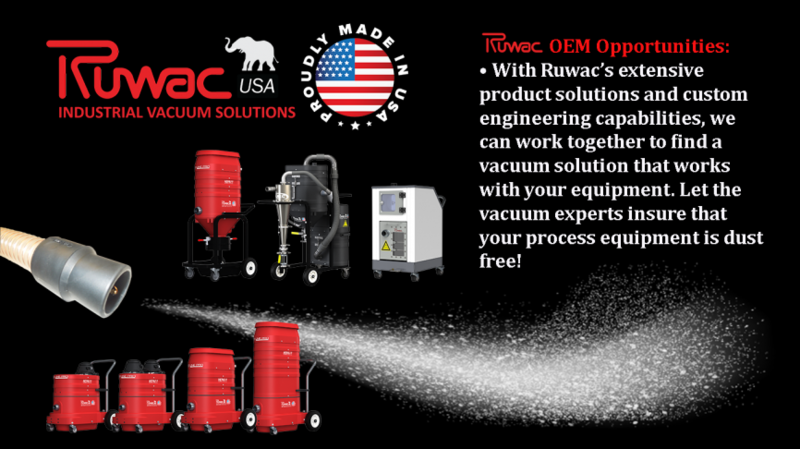 At Ruwac USA., we specialize in industrial vacuums and only industrial vacuums. Because this is all we do, you can rest assure that quality, design and performance are our utmost priorities. We stand behind every vacuum system we manufacture. We won’t recommend a vacuum system without knowing the application, the amount of use within the application and who will be using the vacuum system. We pride ourselves in providing industrial vacuums that fit your application and exceed your expectations. Established in 1984, Ruwac USA is one of America’s most innovative designers and manufacturers of technologically advanced, superior quality industrial vacuum systems for virtually all industrial applications, including, but not limited to: building maintenance, manufacturing processes, explosion proof safety, fume extraction, dust removal, machine tools and more. With Ruwac’s extensive product solutions and custom engineering capabilities, we can work together to find a vacuum solution that works with your equipment. Let the vacuum experts insure that your process equipment is dust free. Click here to submit an OEM Request. Submit your OEM Request Today!